My oh my! 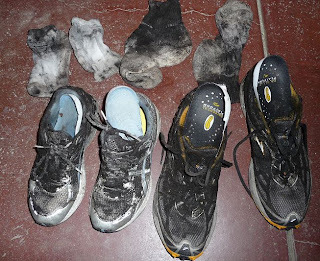 DH and I went hashing in Commerce Twp and the hares laid quite a trail with lots of shiggy to dirty our shoes. I got my shoes mucky when I was shimmying down a tree on my stomach while straddling the tree and lost my balance at the very end which of course landed me in black muck that looked more like oil than mud. I laughed for a long time after that! What fun!